Joel Embiid has moved on from adidas, to Under Armour. 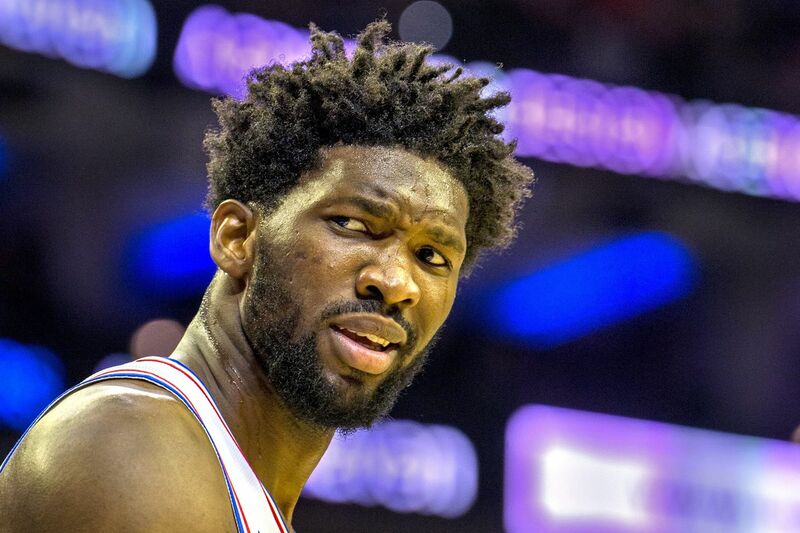 Joel Embiid is getting paid. The 76ers star signed a five-year shoe deal with Under Armour, and according to ESPN, the endorsement's value will make him the highest-paid center in the NBA. Embiid, 24, officially signed with Under Armour on Sept. 28 — Sixers media day — and was wearing Under Armour sneakers throughout training camp and the preseason. Previously, Embiid's contract had been with Adidas. New Balance and Puma also were courting Embiid along with Adidas, but in the end it was Under Armour that won over the Sixers star. "There were a few brands involved, but I'm excited about the future and I feel like I made a great decision," Embiid said Wednesday. Under Armour beat out the competition by committing to build Embiid's brand through custom shoes and agreeing to donate to charities in the Philadelphia area and in Embiid's native Cameroon. There's also the chance Embiid could release his own apparel and sneakers. "I still have a lot of potential on the basketball court, and when you talk about creating a brand, for me personally, I feel like it hasn't been explored completely in the way that it is supposed to," Embiid said. "Just talking to Under Armour and listening to them, I feel like they're going to give me the chance to do that." Joel Embiid poses with kids from the Boys and Girls Club of Northeast Frankford. That's one piece of the equation, and for Embiid, not the most important piece. The biggest selling point was what Embiid calls the "community part and helping people." In a letter Embiid wrote on the Under Armour website, he details his rise from a 16-year-old in Cameroon to where he is today. He writes that his brother Arthur, who died in a car accident in October 2014, used to give clothes and food to those less fortunate in their hometown when he was just a teenager. On every pair of Adidas shoes that Embiid wore, his brother's name was embroidered just on the inside above the ankle. Embiid said that will still be the case with his Under Armour shoes. "My brother inspires me so much, that's what this is really about," he said. Joel Embiid on an Under Armour truck on Wednesday. Embiid has consistently tried to find ways to make his actions count outside of basketball, whether that's in community events around the Philadelphia area or with his foundation, run by his parents, in Cameroon. "I care so much about Africa and there are people back home that don't have anything at all and I want to help them, and my brother inspired me to do that," he said. "I look at myself, living in America, blessed and fortunate to live this life, and I feel like I have to do it. I have to help. And it's not just Africa, Philly is a part of me, too, and I want to give back to the people here." In his first community event with Under Armour, Embiid showed up to the Boys and Girls Club of Northeast Frankford, surprising the crowd with shirts, sweaters, water bottles, photos, and autographs. "This is the first step, we're just getting started," he said. Embiid is coming off a season in which he averaged 22.9 points per game. was an All-Star starter, and was runner-up for defensive player of the year honors. Although most blockbuster shoe deals go to guards or forwards, Embiid has become one of the most marketable players in the league and doesn't see his height or his position as things that should hold him back from any kind of endorsement. "I'm more than a big man," Embiid said. "I'm a basketball player. I'm as versatile as they come." The Sixers will open their season Tuesday against the Celtics in a playoff rematch in Boston. Their home opener is next Thursday against the Bulls.